LG has announced a new kind of IPS liquid crystal panel that features an improved color reproduction. The Nano IPS technology will be used for LG’s upcoming high-end displays due in 2018 and will enable professional-grade DCI-P3 color space coverage on consumer models. One of the first monitors to use Nano IPS will be the 32UK950. The 32UK950 will be LG’s new flagship consumer 4K LCD, and will feature the VESA HDR 600 badge along with an integrated Thunderbolt 3 dock. LG’s Nano IPS technology will be used on numerous high-end monitors by the company, so it makes sense to examine what manufacturer tells us about it before jumping to the actual product. LG says that it applies nanoparticles to the screen’s LED backlighting to absorb excess light wavelengths and improve intensity, purity as well as the accuracy of the on-screen colors. Controlling spectral output of backlighting is a method generally used to improve IPS LCD panels — quantum dots and Panasonic’s light modulating cells do just that. Adjusting backlighting spectral output not only enables to improve color reproduction, but also contrast ratio, but this is where LG’s press release gets vague. It never discloses or even mentions static contrast ratio, yet to get the HDR 600 badge (which is what the 32UK950 has), you need to get a black level of 0.1 nits max, which VESA believes is impossible without local dimming. However, neither local dimming, nor pixel-by-pixel control of backlight intensity, are mentioned in the press release. Wrapping things up, we know for sure that LG’s Nano IPS enables the company to offer an improved color gamut by controlling the LED backlighting. 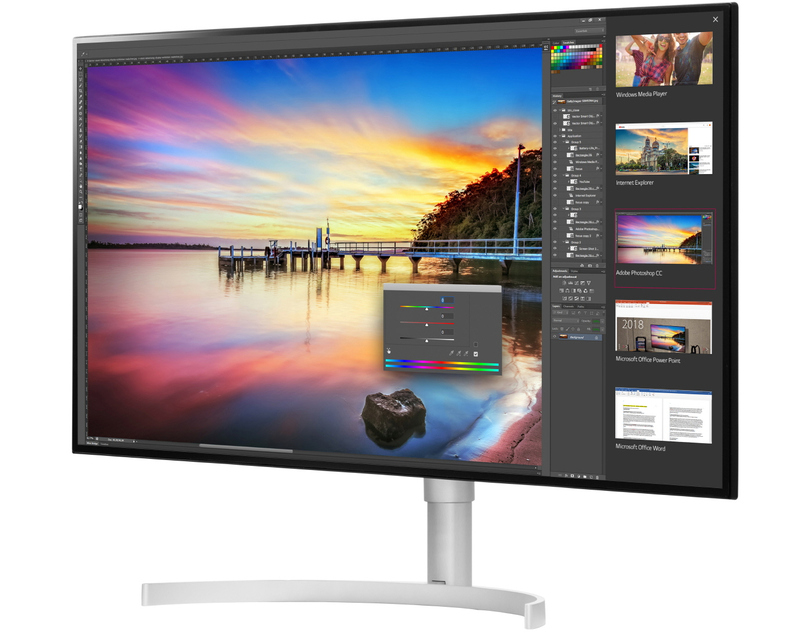 The contrast ratio is something that is expected to be improved on new monitors as well, but LG does not say whether its Nano IPS is responsible for that. 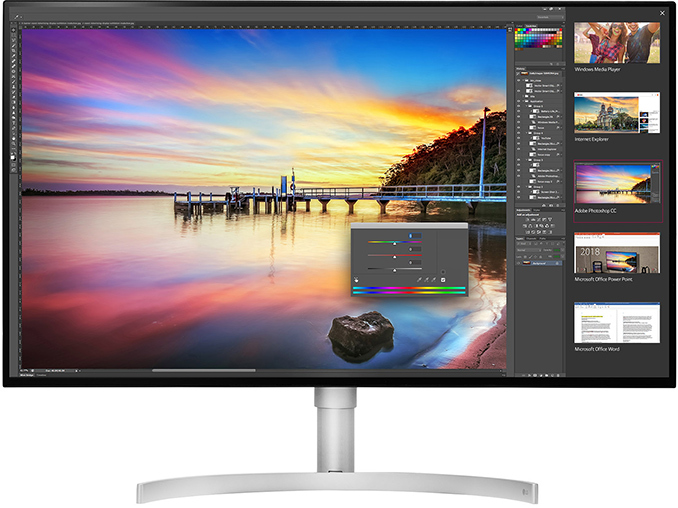 Among the first monitors to feature the Nano IPS technology will be the LG 32UK950. Its 32” panel has a 3840×2160 resolution, can reproduce 1.07 billion colors and cover 98% of the DCI-P3 color space. The HDR 600 badge clearly points to HDR10 processing capabilities along with up to 600 nits brightness, but LG does not disclose any information regarding its LUTs (look-up-tables) for HDR. LG’s current-generation consumer flagship display (the 32UD99-W) can cover 95% of the DCI-P3 gamut, which was a bit lower than 97% DCI-P3 coverage by the 31MU97-B, a professional display with a 4096×2160 resolution. The upcoming 32UK950 will surpass both models when it comes to gamut coverage. 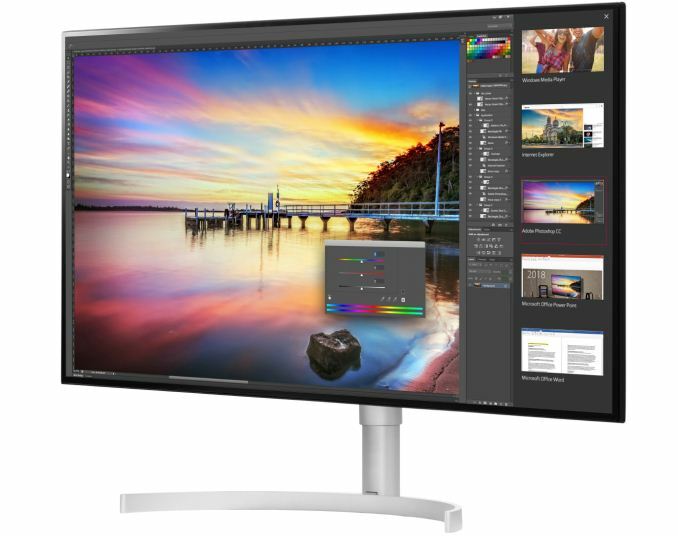 Another major selling point of the LG 32UK950 will be an integrated Thunderbolt 3 connectivity with daisy chaining support (enabling to connect two 4Kp60 displays using a single TB3 port on the host). Apart from TB3 headers, we expect the LG 32UK950 to feature regular DisplayPort and HDMI inputs, a USB 3.0 hub and other essential features. LG plans to show the 32UK950 at CES trade show early next month. The company does not reveal when it intends to start sales of the new product, or its MSRP. As someone with 20/15 vision, yea it's useful for that. I have a budget 24" 4K IPS Acer display at home (K242HQK), it makes web content look really sharp, especially fonts, after using ctrl + mousewheel up to enlarge the content to fit the screen. There's no noticeable degradation in static size content (images, for example) either, 4K at 24" or 1080 at 24" showing the image at the same size doesn't magically reveal dithering or anything. Really get tired of the asinine responses to better advances in technology, usually revolving around "But you don't need it! It doesn't do anything better than (old tech), and human senses won't be able to appreciably notice any difference anyways!". If it were up to people like you, we'd still be using campfires to cook food because any advancements in heating elements (and we have magnetic-induction stovetops in the current day) would just memed on about it not being appreciably better in any significant way than a traditional wood-burning fire source. Can you measure the individual pixel fidelity to the source Camera Pixels? Does this Picasso looking test image have 100% fidelity to the source?